Are you stumped for topics for your next blog post, or having trouble choosing between so many ideas? 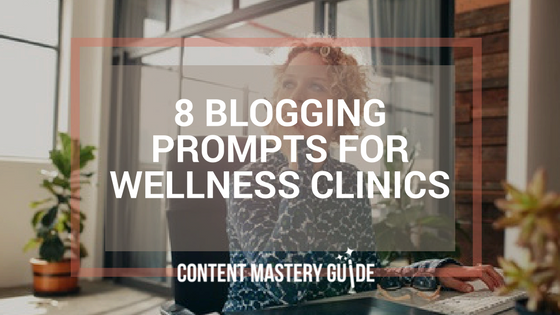 I know either can be an issue for both seasoned and new wellness bloggers. Use these blogging prompts to choose and write your next post, or write all eight and you’ll be set for weeks! Introduce a member of your wellness practitioner team. Focus on why they are passionate about their area(s) of expertise, and when/why they joined your team. As a call to action, invite readers to follow the practitioner’s profile or page on social media, or book an appointment for a treatment. Recommend a product or tool. Describe something you and your team use to deliver your wellness services, or something you use personally for your own self-care. As a call to action, ask readers if they’ve tried the tool and to share what they like or don’t like – you can open up your blog for comments, but many bloggers have now moved their community conversations over to social media. Offer season-specific wellness tips. Which health issues do you see the most at this time of year? What do you wish clients knew and did on their own before coming to see you? As a call to action, provide clear and concrete self-care tips people can do immediately on their own. Recognize good work in your community. Use your blog to give back by highlighting the work of a community group or event. Share photos and stories of any personal connection with your business, e.g., if someone on your team has been touched by the issue, and/or if you’re doing your own fundraising or awareness campaign. As a call to action, provide links for online donations or to learn more, or invite people to visit your clinic to drop-off donations. Equip your readers for healthy travelling. Business trips, family events, and vacations happen all year round, so this is a topic you can revisit. Interview members of your team for their most successful strategies and compile those into a blog post. As a call to action, ask readers to post travel photos, with bonus points if they show themselves using any of the strategies. Debunk a myth (e.g., The truth about ______) or reveal a secret (e.g., 10 things you didn’t know about….). This is also a great opportunity to refer to relevant research, to show that you’re backing up your claims and keeping up with advancements in your field. Just be sure to leave out any jargon so it’s easy for non-professionals to understand. As a call to action, ask readers what surprised them the most in your post, or what was the most meaningful insight they gained. Answer a frequently asked question (e.g., How to _____). The more specific, the better. If you find yourself branching off into related topics, let them go. You can always write more blog posts! As a call to action, encourage readers to try out your suggestions and ask them to let you know how things turn out. Before you launch or re-launch your blog, make sure you have a solid blogging plan in place. Start here with my four-step wellness blogging plan workbook.